This article is excerpted from Entrepreneur magazine editor in chief Jason Feifer’s monthly newsletter, The Feifer Five. Each month, he sends out five insights to help you think bigger. Subscribe here. How do you evaluate a year? Sure, we can harp on the bad or celebrate the good. I’ve certainly done both. But I prefer to focus mostly on the things I set in motion — the stuff that only began in 2018, but that will become bigger and more important to me in 2019 and beyond. A year isn’t an isolated block of time, after all. It’s an interlocking part. Our work in one year should strengthen the next. With that in mind, here are five big things to think about as you springboard into 2019. 1. Never stop changing, or you’ll become a video store. Behold, a copy of Entrepreneur from 1980! We’ve been looking at this issue a lot lately, because it’s the first time our magazine published a "Franchise 500" list — and we’ve produced the 40th one, to come out this month. "One of the hottest new entries in the race for consumers’ dollars is artificial suntanning parlors." "The brightest star in the fast-food heaven is Mexican food." "In the ’80s, look for new foods: beef bowls from Japan and sushi bars." "Inexpensive home computers, likely to be tied to the telephone and television set in an information/entertainment complex, should be a reality by the end of the decade." "A high-margin business that has existed for some time in ‘mom & pop’ fashion is lawn and garden care. … Look for others to come along in this underrated but fertile field." "Sports usually have shorter cycles than most things, but it is not far-fetched to expect indoor/outdoor disco roller rinks to spread across the country." "We’ve reported on the incredible potential of video stores." My takeaway after reading it all: This is exactly why companies need to be constantly evolving. We all have the instinct to hit pause — to decide that we’ve found some version of success, and now we just want to protect it as long as we can. But we can’t. Time marches on. Suntanning parlors come and go (thankfully). The "incredible potential of video stores" comes to an abrupt and complete halt. Things change. We need to change with them. The past contains all the evidence you need. Now let’s all move forward. 2. Small things can have outsize impacts. As anyone who’s written to me can attest, I’m responsive. I respond by email, LinkedIn, Instagram, Twitter and pretty much any other way someone can find me. Why? Because I enjoy it. Because I think anyone who takes the time to reach out deserves a response. But also, because it’s strategic: I know that when I respond to someone who follows my work, I’m strengthening the bond they have with me. It’s really the simplest, easiest and most enjoyable way to create a fan. This month, though, I got an insight into just how powerful a response can be. It came from a woman named Carlee Lloyd, who had reached out to me on LinkedIn. I replied and later agreed to be interviewed briefly for a project she was working on. She in turn wrote a piece on Thrive Global called "What Jason Feifer Taught Me About the Power of Kindness," which was really a generous and lovely gesture. Here’s a portion of what she wrote: "I had long been an reader of Entrepreneur magazine both on and offline, but my loyalty to the company and to Jason grew beyond measure the moment I was able to identify with him as a human being. Putting a real person behind the work made it relatable, and it made me want to celebrate his successes as my own." That’s what I’m talking about! She nails it. When you put something out into the world, your job is only halfway done. The real value comes later — when someone sees what you’re doing and reaches out, and you reach back. 3. To embrace the future, recognize the past. With each passing year, we participate in a cycle that goes like this: Something new is introduced, people resist it because it threatens an old thing, then we come to accept and value this new thing, then the new thing begins to feel like an old thing, and then we feel protective over this once-new thing when the next new thing comes along, which we resist. Why do we do this? I’ve spent years researching this for my podcast Pessimists Archive, which investigates why people resisted innovations like coffee and the novel. And in a new piece for the Washington Post called "Why Do We Keep Panicking Over Tech?," I break down the three main reasons people resist innovations. Here’s the takeaway: "People have little idea how innovations will affect the world in the long term, and the impact is almost never as bad as predicted." The next time you hear someone bemoaning smartphones or whatever, go ahead and send them a link to my story. Then let’s all break the cycle of needless fear and resistance, and keep focused on progress. 4. Lead with your value, not your desire. That email rolled into my inbox a few days ago. Maybe you have some questions. I sure do! 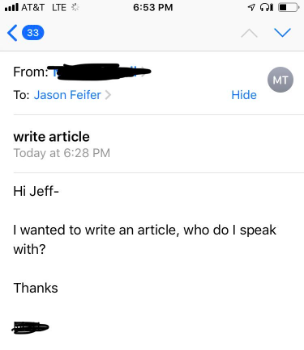 What kind of article does he want to write? Why is he qualified to write this article? Why is it something I’d want to publish? When did my name become Jeff? And more! This is a comically bad pitch, of course, but it represents something I see all the time: People are blinded by their own interests. They lead with what they want, not with what they can provide. And that’ll never get them anywhere. Here’s the harsh reality: Nobody — nobody! — cares what you want. But they do care about what you can do for them. You don’t tell an investor that you want their money; you tell an investor that your company can make them a lot of money! You don’t tell a customer that you want their purchase; you tell them how valuable your product is for them! I know, I know: All that sounds obvious. But in day-to-day interactions, I think we often fail to remember it. We slip up — talking too much about ourselves, pivoting any interaction too quickly toward the thing we desire. You can see that in the email I received. This person wants to write an article, but he’s so laser-focused on that desire that he failed to sell me on the idea. He offered no value. So that’s my challenge to you next year: Be relentless on value. Get what you want by providing what someone else wants. 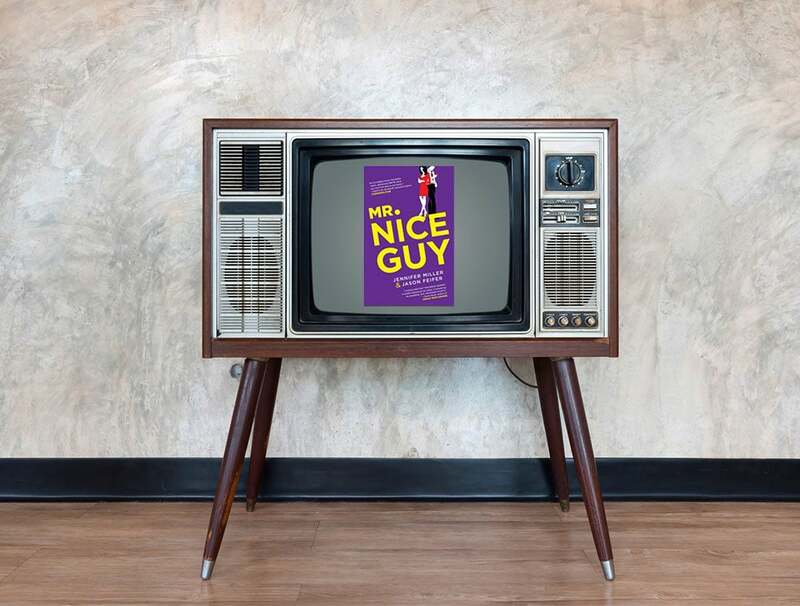 As many of you know, my novel Mr. Nice Guy (which I wrote with my wife) came out in October. And now we have some more news: It’s being developed for TV! After learning this, a lot of people asked me the same thing: "Did you plan for this to happen?" My answer: Few things happen by accident. If you want them, plan for them. Of course, there’s no way we could have guaranteed this. But we knew we wanted to write a book that could be adapted for the screen, so we baked that sensibility into the pages. We studied the pacing and narrative arcs of movies, and then built ours the same way. We wrote scenes that seemed particularly cinematic, hoping they’d jump out at producers. We tried to do Hollywood’s job for them. I believe that we all, as creators and entrepreneurs, should never just be making one thing. Our "one thing" should have the DNA of many things — it should be designed to evolve and expand, to be ever-useful and growing. That starts at the very beginning. It starts in the planning. What happens in the year (or years) ahead? I don’t know. The TV show could be made, or not. I can’t control it. But I know that I gave it the best chance I knew how. There’s satisfaction in that. And that’s all for this month’s Feifer Five! To make sure you never miss Feifer’s monthly dose of inspiration, subscribe here.